This week, for me, is all about taking chances. Remember when I told you back in May that there was something in the works for me to get back to what led me to choose journalism as a profession? Well, things with that really get started this week. Earlier this month, we took my noon show on the road for a patriotic newscast. As part of that show, I put together a feature on the 98th Army Silver Wings Band. Since then, I've put together two very quick, easy-to-piece-together packages for our early evening newscast on days when we were short-handed (all while producing two shows). This week, in addition to producing my two daily shows, I will be venturing out a couple of mornings to cover some stuff happening in my hometown. I'm extremely excited but at the same time nervous because I haven't done this in so long. But, in the end, I believe it will be worth the risk. And eventually, I'll be down to producing just one show a day and reporting for the rest. Happy Monday, everyone! 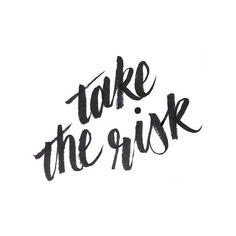 Take a risk this week!